“I wont take care of Myself,Government should take care of me” Lets look into Delhi Zoo Incident..
1. White Tiger enclosure has three layer Protection . 2. First Understand the basics of Safety.Safety measures are taken to avoid Accidents not deliberate Incidents. 3. Tiger didn’t invade the Victim’s territory,Victim only intruded Tiger’s only territory. 4. 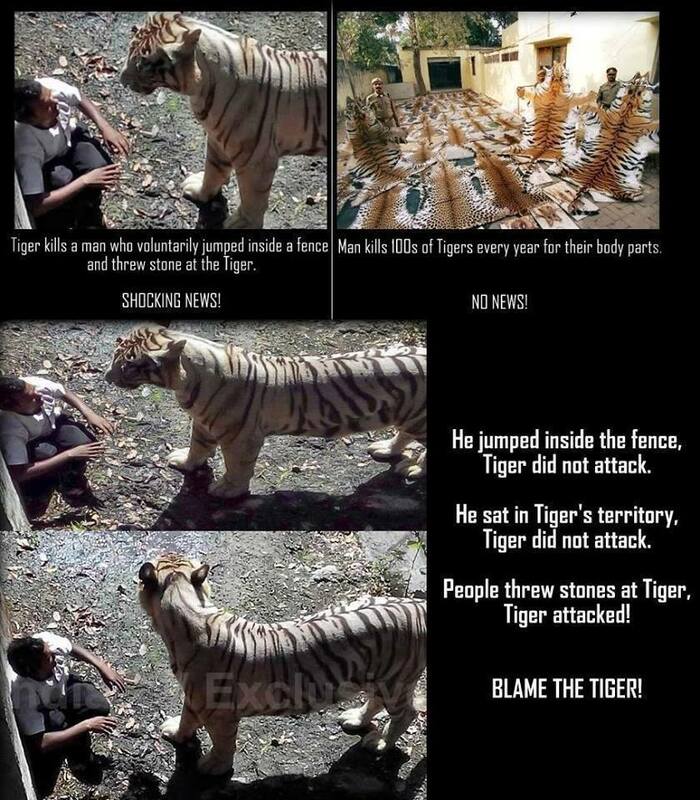 Tiger didn’t hunt or attack the Victim even though Victim was in Tiger’s territory. 5. Tiger was only examining the Victim, for the Tiger Victim is “newfound thing ” in his territory not prey. If it was prey then Tiger would have killed the victim at first sight and would have eaten him too. 6. Tiger was in licking space to Victim, Anything like stupid rescue attempts of fire, shouting, stoning will only provoke Tiger. 7. Tranquilizing the Tiger is not possible in that particular situation. 8. To knockout a full grown adult Tiger through Tranquilizer will take atleast 10-15 mins ..
9. Even if we tranquilize the Tiger ,in meantime Tiger would have killed the newfound thing (Victim) in one slap. 10. Tiger is the largest cat of all, Tiger is larger, very powerful than Lions. 11. Tiger will/can kill two lions at a time. 12. The Tiger (Vijay) was well fed and not in hunger, the Tiger has no intention to kill the Victim at first place. 13. Since the Tiger was attacked by The people and the Victim by pelting stones, The Tiger left place with his newfound thing(Victim). 14. Tiger jaw can crush the Human skull easily in fraction of second. 15. Victim would have died in first drag itself. 16. Victim put himself in Unescapable Situation. 17. Only way to Save the Victim was People and the Victim should have been kept quiet and Tiger would have left Victim unharmed since Tiger was staring the Victim for sometime. Zoo keepers could have Drawn out the Staring Tiger by throwing up a live goat or chicken But people spoiled and the Victim spoiled the only chance. 18. Forget about the Fences, Warning signs, Zoo keepers here.. There are Dozen Tigers inside the enclosure.. Do we need anymore Warning than this ??? 19. People who ask to rise the walls; first understand onething, Tiger won’t eat, sleep, reproduce unless it feels like it has their own environment. Our Zoos do their best to recreate that!!! 20. 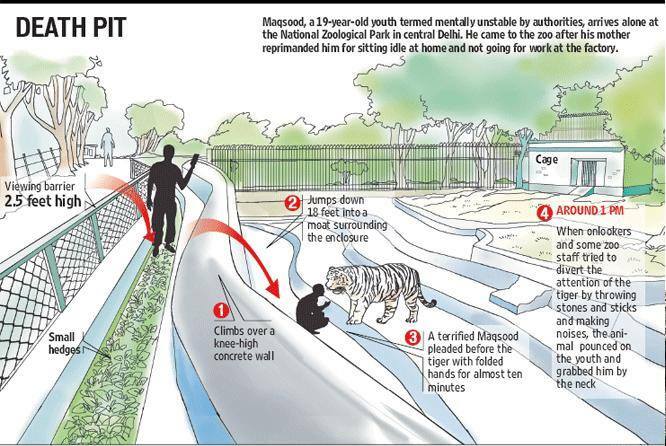 Delhi zoo is in exhibit for morethan 50 years, Millions of people visits the same enclosure, now all of a sudden some random guy who deliberately jumped the barricades by ignoring all the warning, knowing that it was the Tigers inside we blame Zoo keepers ??? Seriously ?? 21. Have you ever Visited a Zoo ?… if so ,Seriously you think Zoo’s are not safe ?? 22. There are one Zoo keeper per enclosure will be present in every Zoo. He has to manage all the visitors on his enclosure. Eyewitness say Zoo keeper also warned the victim at 12.50 pm for leaning against the barricade, while he was managing other visitors at 1 pm, the victim has crossed all the barricades and fallen into enclosure. 24. We kill Tigers if he enters in our village or in our area.. but Tigers shouldn’t the do the same?? Good logic and Morality..!! Keep it up!! 25. Tigers are largest cats of all and it needs atleast 3-5 kms of space per Tiger, but still we put them in limited enclosure and that too in group. 26. Tiger is an solitary animal they never live in group. Do u know how much stress it undergoes if we force them to live in groups?? But i don’t go to the point that “Do we need Zoos?” Because Zoos are the one of main bridge between humankind and wild in current scenario. The critically endangered species like white tiger needs to be kept alive in zoo in-order to avoid extinction!!! 27. Now what? Do u want to bring in an argument by saying Visitors will misbehave because we are humans but Zoo keepers must control them since they are from Mars? Hmm? That’s how our thought process work isn’t?? 28. Please don’t bring here. They are saved there, this happened in America, that happened in Africa!!! This is India, we are Indians and tell me what is applicable in this situation!!! 29. I’m Pretty Sure that “Mentally ill” concept will arise as it always arises in all Zoo accidents since that’s the only way case will get resolved for officials and family will get compensation!! 30. These people can be categorized in Separate genre! This Tiger Victim is one of the fool belongs this category! I have spoken to many Zoo officials, all the inform me that its almost impossible to control college students since they form group to threaten the sincere officials! I myself a witness of this moronic act in Vandaloor Zoo, Chennai, India! Watch the Video! Tell me How stop them? MOPSOTHCRDRCARD – Did you see this in your Credit Card or Debit Card or Net Banking statement? Puzzled about it? It is nothing else the either your Passport or VISA Charge for India. Also apart from this, this is also used by the Tourism Department of Government of India. When we say that I am a Tax-Payer, it makes all of us to feel proud about the situation and the place where we stay about because of the defaulters list as per the Income Tax department is growing everyday relatively as the total number of accounts (savings, current, etc) are growing. Now the Prime Minister of India has initiated a new policy of opening an account with zero balance in all the banks and even I have did it with my Aadhar Card. Apart from this there are few embarrassing situations which will hate us to pay the taxes like the improper development of roads, improper facilitation and others. Away from all these, I (on my behalf) have encountered a embarrassing situation in Bangalore. A cycle wala around 35 years was pedaling his cycle in the middle of the road in a highway. The usage of lights dipping went failed as it is India, then I had to next weapon Honking with my 12 rings horn. Suddenly he stopped the cycle in the middle of the road and turned to my side saying “Hurray, I have paid the taxes to the Government, so this is my road and keep following me”. Now it was my turn now, my Indian mind-voice was saying “You poor fellow, you would have either paid your income or commercial tax, but I pay Income Tax, Sales Tax, Commercial Tax along with the huge RTO for my car and apart from this, I pay the Tollway Charges for driving the car into this dummy road too”. So, turning diplomatic, I sealed my mouth with saliva and took the car in 2nd gear…. …. and finally arrived my destination with 14 minutes of delay.